This is one of our cards, and it’s named The Wall. 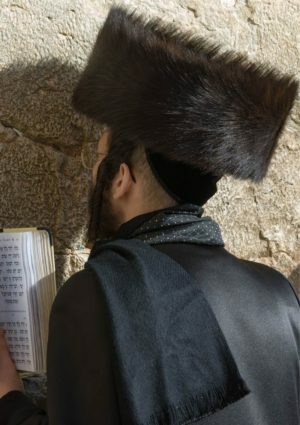 It features a man wearing a fur hat, called a shtreimel, praying at the Western Wall in the Old City of Jerusalem. The photo at the bottom of this article shows the man and more of the wall around him, including the gaps between the stones. You will see that there are lots of scraps of paper in the gaps between the stones. People write prayers on scraps of paper and put them in the gaps between the stones in the Western Wall. Maybe you wonder what happens when the prayers written on scraps of paper fall to the ground? Well, when any prayers fall out of the gaps in the walls, they are not thrown away. As a mark of respect, the religious authorities store the notes along with old prayer books and any scrap of paper that has the name of God on it. There are texts hundreds of years old still stored in the storage buildings or genizas. And the Jewish religious authorities still store prayers the same way today. The question is, why pray at a wall? What is so significant about the wall? Jerusalem is a destination that means a lot to a lot of people, and nowhere more than the Western Wall. Stand back from the Western Wall and you can see the Dome of the Rock high up on the Temple Mount. The First and Second Jewish Temples, now destroyed, one stood on the Temple Mount. Solomon built the First Jewish Temple. Many years later the Babylonians invaded and destroyed the temple. The exiled the Jewish population to Babylon, basically carting them off as slaves. Then the Persians conquered the Babylonians, who allowed the Jews to return home some 410 years after their exile. The Jews reconstructed temple, a bit here and a bit there, in between invasions and conquests. Then Herod built the Second Temple on a larger scale than the First Temple with a broad plaza and a series of supporting arches. The Western Wall, at which Jews pray, is the western retaining wall of this plaza. People have been putting prayers on scraps of paper at the Western Wall for centuries. The Romans destroyed the Second Temple in 70 C.E., and exiled the Jews from the city. The Romans then built a temple on the site and subsequently a Christian church. Then Islam became the dominant religion in the region. They built the Dome of the Rock to mark the spot where Mohammed dreamed he had travelled and ascended to heaven. During the crusades the building became the focal point for the Knights Templar until the Moslems regained Jerusalem once more. After the United Nations empowered the creation of the Jewish State in 1947, Jews returned and entered into a war with the surrounding countries. At the end of that, the Jews controlled half of Jerusalem. Then the 1967 War put the whole of Jerusalem under Israeli control. In recognition of the meaning of the moslem buildings on the plaza, the Waqf control the organization of the plaza and of the buildings on it. They built an extension to the Al Aqsa mosque (which sits at the southern end of the plaza) and have another in the planning stage. The mosques attract large congregations on Fridays. 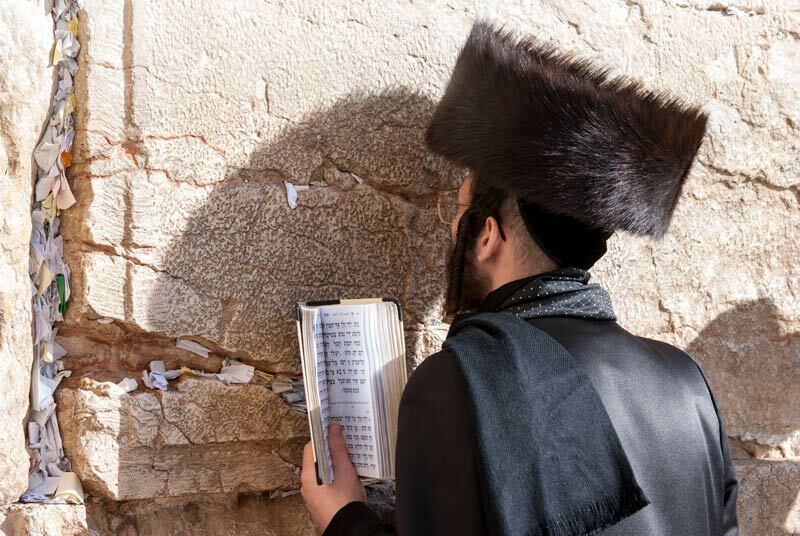 That is the story behind why people pray at the Western Wall and put prayers in the gaps between the huge blocks of stone.